When Nathan Adrian returns from the Rio Olympics, he will have one more swim to complete although this one will likely be more emotional. Adrian will participate in the Swim Across America for his friend and former California teammate Matt Benoit, who lost his battle with Ewings sarcoma in April. He was 28. Benoit was a 2006 graduate of Kennedy Catholic in Burien and California (2010, legal studies) and was a state champion in the 100 backstroke as well as a three-time All-American and USA Swimming Academic All-American. Benoit was training to swim in the SAA event, slated for September 10 along the shores of Lake Washington at Luther Burbank Park in Mercer Island. Olympic swimmers started the event, and Bremerton’s Dana Kirk Martin and Bainbridge’s Emily Silver have both swam to raise funds. This is the eighth year it’s been held locally and monies raised primarily goes to the Seattle Cancer Care Alliance. Last year the event raised more than $276,000 in support of immunotherapy research and pancreatic cancer treatment. Bremerton YMCA Swim Team’s Aziza Meyer set a 8-Under 100-yard butterfly team and league record last weekend at the Age Group Invite at Curtis High School in Tacoma. Meyer’s record was 1 minute, 28.17 seconds. The previous record was held by Olympian Dana Kirk, a Bremerton and Stanford University graduate who swam at the 2004 Olympics in Athens, Greece. Kirk’s record was set in 1993 in 1:31.19. Kirk sent Meyer an autographed picture and congratulations on breaking the record. Also, you can find results of the meet here, which included swimmers from Bainbridge Island Swim Team, Port Townsend Swim Team and Bangor Trident Swim Team. We may not be the biggest community in Western Washington considering who our next door neighbors are — I’m looking at you Seattle and Tacoma — but we did something else those two cities didn’t do this week. 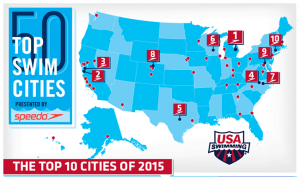 The Bremerton/Silverdale area made the Top 20 of USA Swimming/SpeedoUSA’s Top Swim Cities on Wednesda y.
Bremerton/Silverdale is ranked 17th overall for all cities with a population of 150,000-249,999. (Check out the graphic on the left. That’s us in the corner!! OK, OK, maybe it’s Seattle but I like to think it’s Bremerton). The top city in the smaller category is Columbia, Missouri. It was ranked first based on its high percentage of USA Swimming members, top USA Swimming athletes and large number of fitness swimmers. Hamilton said Kitsap has a strong swimming community — from parents to officials to volunteers — who make the meets work year round. “I know our team, Olympic Aquatic Club, we host five meets a year which is a lot of work,” he said, adding volunteer parents typically spend 40-50 hours during the three day meets. “It’s just a wholesome sport and the community has embraced it,” he said. The top swim cities showcase what’s great about the sport of swimming, said Matt Farrell, chief marketing officer of USA Swimming in a news release. “We want to invite people of all ages across the country to join the sport of swimming and we hope this list inspires more kids and families to get involved,” he said. Bremerton YMCA head coach Marilyn Grindrod said swimming is beneficial no matter if you compete at an elite level or recreationally. “It’s a sport for life,” she said. Bremerton-Silverdale club teams include Bremerton Family YMCA, Haselwood Family YMCA Silverdale and Olympic Aquatic Club. Kitsap’s club teams also include Poulsbo Piranhas, Puget Sound Swim Club, Bainbridge Island Swim Team, Bangor Swim Team, and reaching a little further out on the peninsula, Port Angeles and Port Townsend swim teams. We just missed the cut off for populations with 244,000 or greater, which would have placed Bremerton/Silverdale 13th in the larger category, the Top 50. Seattle is ranked No. 21 in the larger category, with Anchorage, Alaska, coming in at No. 19. No other Pacific Northwest cities made the list. Ann Arbor, Michigan, was once again ranked No. 1 for the second year in the larger category, followed by Durham, North Carolina; Austin, Texas; Madison, Wisconsin; Raleigh-Cary, North Carolina; Fort Collins, Colorado; Washington, D.C.; and Bridgeport-Stamford-Norwalk, Connecticut. Ann Arbor repeated as best swim city, due in part to having the largest percentage of top USA Swimming athletes per population — more than 60 Olympians have come from the University of Michigan’s swim program and area club teams, said USA Swimming. San Jose-Santa Clara is at No. 2. Each city is ranked based on an aggregate score in categories including the percentage of active swimmers and swim clubs, the number of accessible pools (Bremerton/Silverdale has three) and volume of top-level swimmers from the area. It also took into account the number of USA Swimming members, number of U.S. Masters (adult) swimmers, and the number of USA Swimming clubs. California, with five cities in the top 17, and Colorado (four in the top 16) were the highest-ranking states. Cities in the top 50 had populations of 250,000 or more. It’s pretty cool that Bremerton/Silverdale can lay claim to not only national champions, but also high school state champions, age-group champions, masters champions, and, of course, three Olympians in Bremerton’s Tara and Dana Kirk (2004 Olympics) and Nathan Adrian (2008, 2012). If we’re t o include Bainbridge Island, then Emily Silver (2012) makes it four from Kitsap. Speaking of Adrian, the San Francisco-Oakland area moved up to No. 3, which is where he resides and trains with California’s post-grad group that includes fellow Olympic champions A nthony Ervin and Natalie Coughlin. It’s also home to 10 percent of the country’s U.S. Masters swimmers, more than any other city. 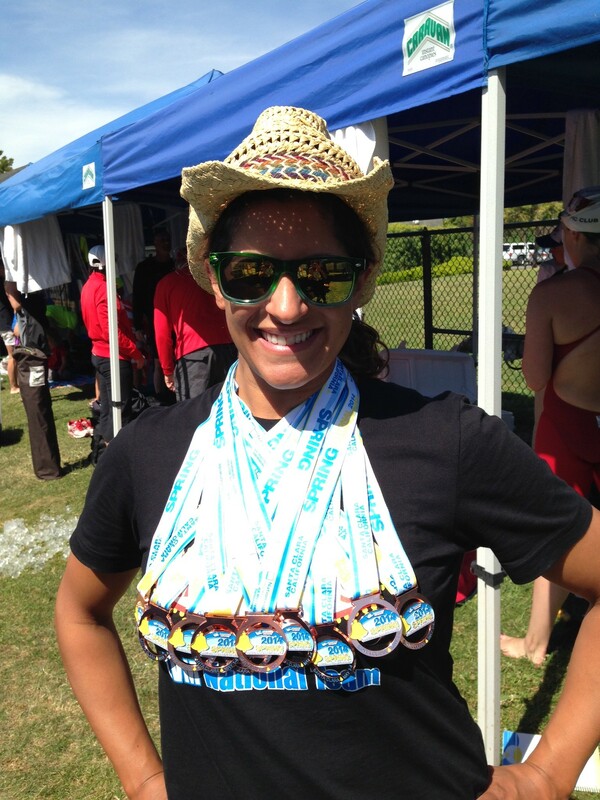 Dana Kirk, a Bremerton native and 2004 Olympian, won the 50-yard butterfly Sunday at the U.S. Masters Spring National Championships in Santa Clara, Calif.
Kirk finished in 24.97 seconds in the 25-29 age division, just off the national age-group record of 24.41 by Tanica Jamison in 2010. Kirk had an impressive weekend, placing first in the 100 individual medley, the 50 and 100 fly and third in the 50 and 100 free. Dr. Melissa Giovanni, a CK graduate, proudly shows off the medal haul from the US Masters Spring National Championships last weekend in Santa Clara, Calif.
Dr. Melissa Giovanni, a graduate of Central Kitsap and former member of Olympic Aquatic Club in Bremerton, earned six top-10 medals at the nationals during her three days of competition. Giovanni finished fourth in the 400 individual medley in 5 minutes, 12.0 seconds in the 30-34 age division. She also placed fifth in the 1,000 freestyle (11:27.21), sixth in the 200 free (2:03.24), seventh in the 50 free (25.82 seconds) and eighth in the 500 free (5:37.42). Giovanni also placed in four relays. 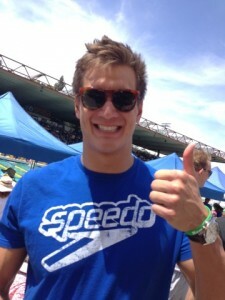 Also, Masters swimming clarified Nathan Adrian’s time in the 100 free on Saturday as 41.13. It’s still a national age-group record. USMS announced a timing error had recorded his time at 41.08. One more thing, check out this great clip of Nathan talking about his 92-year-old teammate. This weekend is making me a reminisce a little. Fourteen years ago I started covering swimming on the peninsula, just about the time that the sport really started gaining ground and national recognition thanks to a handful of swimmers from Bremerton and Bainbridge. Those swimmers included breaststroker Tara Kirk, sister and butterflyer Dana Kirk of Bremerton, Helen Silver, backstroke, and sister Emily Silver, freestyle, of Bainbridge Island and Bremerton’s Justin Adrian, fly/free and eventually his brother Nathan Adrian. It was an exciting time as I was able to travel to California for a week where the Kirks were attending Stanford and Helen Silver was at California, and we ran that story when I came back. The following year in 2004 we went to Long Beach for the U.S. Olympic Trials and watched as both Tara and Dana made the Olympic team — the first time sisters had made the same team in USA Swimming history. The Silvers and Justin competed as well so there was a lot for one hometown reporter to cover. I distinctly remember Justin being so stoked to swim in the final of the 100 butterfly, a race won by Michael Phelps, before he officially called it the end of his career. After the Kirks made the team it wasn’t long before I received a call from our editor at the time to let me know that the paper was going to send myself and a photographer to Athens to cover the Olympics. I’ll never forget my two weeks there as we tried to cover the world’s biggest sporting spectacle from the outside looking in. Because we didn’t have full credentials we spent a lot of time with the Kirks’ parents, Jeff and Margaret, as they toured Athens, the Acropolis and went to beach parties and such. We did manage to find our way into one swimming event, Tara’s 100 breaststroke final, and that was thrilling. She lead after the first 50 meters and I remember sitting in the stands, my photographer trying to shoot from the stands (yes, we weren’t supposed to) and thinking that ‘I’m watching the Olympics and our hometown swimmer is trying to win a medal.’ Surreal. Jumping ahead to Saturday, it’s been great seeing Dana competing at the U.S. Masters Spring National Championships at Santa Clara, Calif. She gave the U.S. trials one more shot in 2012 (good for her as a back injury curtailed her career far too soon) and now that she’s coaching I’m sure it’s also been fun to get back into the competition pool. Dana won the 100-yard individual medley in the 25-29 age category in 57.75 seconds. She also finished third in the 100 free in 52.36. Nathan continues to be the best American sprinter. He won the 100 free in the 25-29 age category in a national age-group record of 41.08, besting the previous time of Darian Townsend’s mark of 42.13 from last Dec. Townsend finished second in Saturday’s race in 43.13. That means Nathan won by almost two seconds. Wow. The time also tied his American record. Dana has one more race Sunday and I’ll post another update then. Nathan Adrian was all smiles after winning the US Masters Spring National title in the 50-yard freestyle Friday in Santa Clara, Calif.
A week after winning two individual titles at the Arena Grand Prix meet in Mesa, Ariz., Nathan Adrian of Bremerton won the 50-meter freestyle at the U.S. Masters Spring National Championships in Santa Clara, Calif., Friday. Adrian touched the wall in 18.78 seconds in the 25-29 category, just off the national record of 18.67 by Fred Bousquet of France in February 2010. He also helped The Olympic Club win the 200 medley relay in 1:26.71, along with Cal training partner Anthony Ervin and Andrew Saeta and Nolan Koon. Nathan wasn’t the only Bremerton native to pick up a national title in the short-course yards meet. Already the owner of numerous junior, national and collegiate swimming titles as well as winning the 2004 U.S. Olympic trials in the 200 butterfly, you can add U.S. Masters national champion to Dana Kirk’s resume too. Kirk won the 100 butterfly in 54.03 in the 25-29 category. She was also third in the 50 free in 24.00. Katherine Raatz won in 23.40. Kirk is slated to swim the 100 freestyle Saturday, as is Nathan. He is seeded first while Dana is seeded sixth. You can also read what Swimming World Magazine had to say about the onslaught of the national record books after the first full day of competition. Bremerton native and 2004 Olympian Dana Kirk Martin is competing this week in the U.S. Masters Spring National Championships. Kirk is seeded among the top contenders in five events — 50-meter butterfly, 100 fly, 50 freestyle, 100 freestyle and 100 individual medley. The meet is being held at the George Haines International Swim Center in Santa Clara, Calif., and began Thursday with long-distance events and continues through Sunday. Kirk Martin is seeded first in Sunday’s 50-meter fly in 25.19 seconds in the 25-29 age division. She is seeded second in Friday’s 100 fly in 57.04; third in Friday’s 50 free in 24.89 , sixth in Saturday’s 100 free in 54.70, and fifth in the 100 IM in one minute, 2.00 seconds on Saturday. Kirk is the aquatics director and head coach at Fremont Hills Country Club in Palo Alto, Calif., and founder/coach of South Palo Alto Swimming. 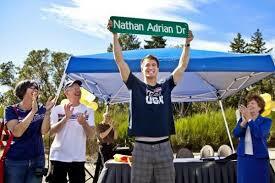 Nathan Adrian, it seems, will always be a favored son of Bremerton. That’s no less true today as it was the moment he won his first individual Olympic gold medal at the London Olympics in 2012. Adrian was back in B-town Monday to help the Bremerton Family YMCA and Bremerton School District kickoff its water safety program for all district third graders. That program will begin Jan. 14. The excitement on the faces of the kids was only outdone by the admiration in the eyes of their parents on Monday. About 40 children, mostly third graders, their families and staff of the six BSD elementaries were invited to the event at the YMCA. Not only does Adrian stand 6-foot-6, which will draw your eye anyway, but every single adult knew the accomplishments he’s made in and out of the pool. The round of applause he received when YMCA aquatics director Rich Tate told the gathered crowd of his 4.0 GPA while in school at the University of California in 2012 was tremendous. A hard work ethic breeds respect and Adrian has plenty of the latter from the Bremerton community. Adrian believes it’s important to give back to the community that supports him so well. Adrian didn’t have a world-class athlete visit his age-group or club teams when he was younger. He was always surrounded by them. Adrian said having fellow Bremertonians Tara and Dana Kirk pave the way by swimming at the Olympics and in college (they both graduated from Stanford University) had a huge impact on him. At Monday’s event Adrian was stopped at nearly every turn, as fans of all ages asked for pictures and autographs while he was given a tour of the facility since its remodel. Quite frankly, it’s fun for me to see as well because I know how appreciative he is of the support he has whenever he comes home. It’s a short stay for the holidays as Adrian will head back to Berkeley, Calif., later this week. He, and his teammates from Cal, including the post-grad group of Anthony Ervin and Natalie Coughlin, will go to the Olympic Training Center in Colorado Springs, Colo., for some intensive high-altitude training in January. “It’s fantastic training,” he said. Adrian’s next competition will be the Austin Grand Prix, Jan. 17-19, at the University of Texas. He’s also been invited for a meet in Rio de Janeiro, Brazil, host of the 2016 Olympics. It’s a chance for American swimmers to get an idea of what it will be like in Rio in two years. If it happens, it would be February or March, and is something along the lines of the Duel in the Pool. Adrian was also thrilled to learn that his Art of the Cap campaign by Speedo and artist Gianmarco Magnani, was a complete success. The caps, which were limited editions and included other artists that teamed with fellow Speedo athletes Dana Vollmer, Natalie Coughlin, Cullen Jones and Ryan Lochte. Proceeds from the sales of Adrian’s cap went to his charity, Kids Beating Cancer. All five caps sold out. Consider it just another feather in the cap of Bremerton’s Olympic champion Nathan Adrian. Adrian raised the 12th Man flag before Sunday’s Seattle Seahawks vs. Arizona Cardinals NFC West Division game at CenturyLink Field. The honor is reserved for celebrities, former athletes and other notables who have ties to Seattle and the Puget Sound area. Adrian tweeted a photo before the game and had a photo go to with it, saying he “couldn’t be more stoked” to raise the flag. He is not the first Bremerton swimmers to raise the flag however. That distinct honor belongs to Bremerton’s first family of swimming, Tara Kirk Sell and Dana Kirk Martin. They raised the flag after returning home from the 2004 Athens Games. Adrian has also been on the field, along with other Bay Area Olympians, for the Oakland Athletics, San Francisco Giants and Oakland Raiders games. Adrian, who lives in Berkeley where he trains with California, flew into Sea-Tac Saturday, attended the game Sunday and will be back in Bremerton to celebrate the holidays with his family this week.